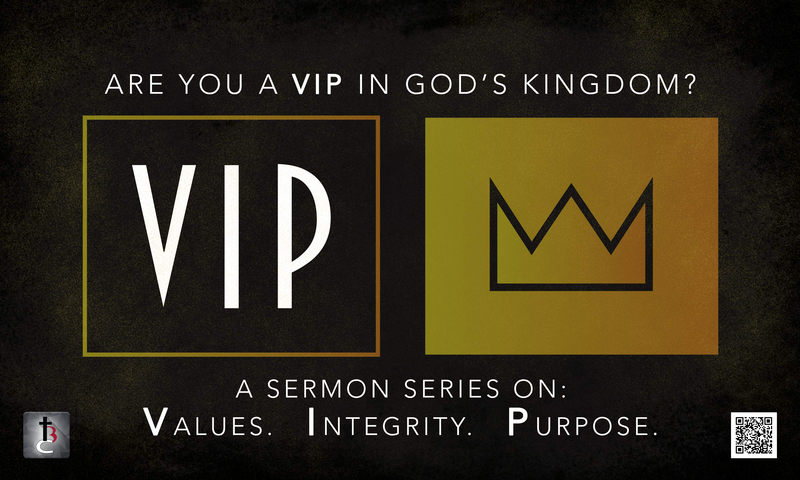 We are looking at part two in our series on what a VIP or Very Important Person is in the Kingdom of God. As we already have seen, the first letter in VIP is a V which stands for Values. A VIP in God’s eyes is a person that has Values or a belief system that is rooted in God’s word. What we believe that is important to us and guides our life. Our life is like a ship sailing through the seas of life and our values or belief system is the rudder that guides our every move and direction. The second letter in our VIP series is an I which stands for Integrity. Our integrity represents if we are putting our values or belief system into action, no matter what the circumstances are. It’s our consistency to being honest with others, ourselves and most importantly to God. If you look up integrity in the dictionary, it says the quality of being honest and fair, the state of being complete or whole, to firmly adhere to a code of moral or artistic value, to be incorruptible. Today we look at a young man named Joseph that exemplified integrity by his actions, even while he was just a teenager and even when he had been mistreated and wasn’t in the best of circumstances. What can we learn from Joseph that reveals if you and I are people of integrity? In some circumstances, it may seem more prosperous financially or image-wise to not do what’s right, but if I’m going to be a person of integrity, I must do what is right in the eyes of the Lord! Joseph was a slave, but he still did what was right and the Lord made him prosper. is coming from. Joseph was pressured by Potiphar’s wife, but he did not give in. When we are all alone and not around other people, that’s when our integrity is really tested to see if we will do what’s right. Even when it seems that no one else will ever know. Joseph did what was right even when he was all alone with Potiphar’s wife. Ask yourself the question today, am I really a person of integrity that does what is right even when it’s not prosperous, even when I’m under pressure and even when I’m not around other people? Will you make the decision today, to be a person of integrity in the eyes of the Lord?